How Are Magnets Made and What Are They Made Of? Okay, we’ve established that magnets are amazing. They’re used in everything from car engines to computers. And of course, they hold your latest straight “A” report card or artistic masterpiece to your family’s fridge. We’ve also reviewed how magnets work, what a magnetic field is, and how to tell which pole is which. But how are they made, and what are they made of, exactly? What’s IN a magnet? Well, that depends on whether you’re talking about a natural magnet or a manmade magnet. Yup, there really is a magnet found in nature! 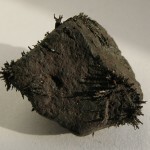 Lodestone, a naturally magnetized piece of magnetite, attracts iron, so it is technically a magnet. There are some fun stories about the ancient discoveries and uses of magnetite and lodestone on our blog. The rest of the magnets we see today are created—manmade. 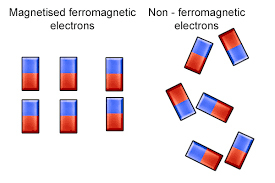 There is a group of materials known as ferromagnetic materials. This group includes iron, cobalt, nickel, and some alloys of rare earth elements (mainly neodymium and samarium). These ferromagnetic materials can be made magnetic by exposing them to a magnetic field using electric current. Using a magnetizing fixture that directs current through the non-magnetized part, electrons in these metals are lined up, or polarized, making the material magnetic. You can learn more about the polarization process here. Some manmade magnets will maintain their magnetic properties forever*. These are referred to as permanent magnets. Some will only be magnetic when in the presence of an external magnetic field, such as from a permanent magnet. These “temporary” magnets are called soft magnets. Another type of manmade magnet is the electromagnet. 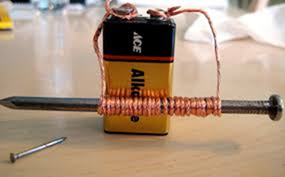 Electromagnets are created when a current of electricity moves through a coil of wire. The coil is magnetic as long as it is receiving the electrical current. But pull the plug on the electricity, and you’ll pull the plug on the magnetism, too. While you’d need highly specialized machinery to create most manmade magnets, you can create your own simple electromagnet or conduct in-depth electromagnet projects at home or in school!